Ideal for motorcycle maintenance and general use. Easy to install basic hand tools. 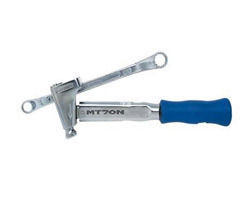 MT70N with wheel wrench makes it possible to tighten the wheel nuts. A click will signal that the proper amount of torque has been applied. Easy torque setting by graduation. Scale, hex key and carrying case are supplied as standard accessory. Accuracy for MT70N is ±5%.